11x14 inch KISS concert photo autographed by the legendary Gene Simmons. 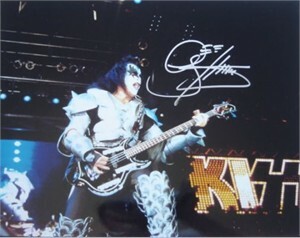 The photo was autographed on 7/22/03 in New Jersey at a rare autograph session. Authenticated by Real Deal Memorabilia, with their holograms on the photo and certificate of authenticity. ONLY ONE LEFT.